Low joined the army at an early date in the War, and received officer training. I was a soldier, or rather I pretended to be one. Even the Army and Navy Stories with its excellent tailoring department could not complete the illusion, although it was never as difficult when it came to 1939, as it was originally in 1914. In those far-off days we had to have swords, and these were in regrettably short supply. My trouble was solved by producing a most horrible-looking sabre which had belonged to my grandfather, and which was in the lumber room of my house. It gave the air of extreme smartness, although I was warned that it might not be really useful (69). After a few months he was promoted to captain and seconded to the Royal Flying Corps. The interview was not exactly rigorous: as Low presents it, all the interviewer asked was what school Low had been to, and on hearing it was St Paul’s, was told “All right. Go and get yourself medically examined” (72). The project which was assigned to him was to find a way of remotely controlling an aircraft, so it could be used as a weapon: in effect, a guided missile. The project was called AT, Aerial Target, to fool the Germans into thinking that they were building a drone to use for anti-aircraft practice. 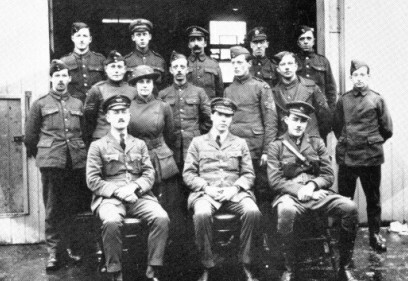 They created a prototype, and the Royal Flying Corps Experimental Works was created to build the first proper AT, complete with explosives: they are pictured above, with Low in the centre of the front row. As head of the Experimental Works, “I was given about thirty picked men, jewellers, carpenters and air craftsmen, and we built the first aerial target” (75). The AT had its first trial on 21 March 1917 at Uphaven on Salisbury Plain. Low and his team were able to control it remotely; but engine failure led to a crash landing. There were further test runs, but the authorities did not decide to take it further; the German doodlebug of the Second World War was based on similar principles. By the end of 1917, we also designed the electrically-steered rocket, almost the exact counterpart of the one which was used in 1942 by the Germans against our merchant shipping. This was the world’s first wireless, or wire-guided, rocket (80). It seems that the Germans were more aware than the British how dangerous Low’s work could be. There were apparently two attempts to assassinate him in 1915. Shots were fired through his laboratory window, and a visitor with a German accent offered him a cigarette, which was found to have lethal quantities of strychnine chloride (81). We are here well into Bulldog Drummond territory (see entry on McNeile). Rumours of secret weapons went the other direction too: Low was sent to Paris to investigate rumours the enemy had a gadget that could raised tons of steel with the help of a pocket battery; and he went to Spain to investigate rumours of a death-ray. Sadly (or perhaps fortunately) both of these rumours were, as they say, mere science fiction. If these patents [for the guided missile and the steerable rocket] had not long expired, I would now undoubtedly be a multi-millionnaire, but I received absolutely no award whatever on the grounds clearly stated, that I had been employed for this work (70). The war was dying. The end came that autumn, when he was feeling so sick of it that he felt he could not endure another moment. He had to carry on because he was part of the great machinery. When the end came he was sitting in a dreary office, poring over papers. It was a back room. At that time the title ‘Back Room Boys’ had not yet been invented; in the Second World War it was something of an honour, but in the first, scientists were hardly noticed, most certainly they were not appreciated by the country which they served. […] A grey November day was struggling to drag itself out of the laggard haze. Somewhere in an adjoining lab. an assistant was whistling “Over There”. The First World War was over (87). Wikipedia was helpful in compiling this; but most of my (and their) information came from Ursula Bloom, He Lit the Lamp: A Biography of Professor A.M. Low (London: Burke, 1958), from which all the quotations come.